It’s true that indexing proponents discourage people from trying to pick their own stocks and suggest they just buy an index of all stocks. Golfers can improve through training and practice; why can’t stock pickers improve? The truth is that we can improve our abilities to analyze stocks. But investing offers an alternative not available to golfers. Imagine if you had the option to receive the average prize at the next professional golf tournament without doing anything at all. Instead of hoping for some natural golf talent, buying equipment, spending years building skills, and traveling to tournaments, you just sit on your couch and collect the average player’s prize. Of course, we don’t have this option in golf, but we can do it with investing. Instead of competing with the bulk of investing dollars controlled by professionals, we can just get their average performance by investing in index funds. It’s true that if I work at it I can learn to analyze stocks better. But I won’t become better than the average professional investor. I can shrink the gap between me and the pros, but I’ll remain better off just buying index funds. There are a small number of investors who may be able to build the skills necessary to compete effectively with investing pros, but almost all of us are better off focusing on a sensible asset allocation and buying index funds. There are some who will say they’d rather play golf than sit on the couch. So would I. But I know I’ll never play well enough to compete with the average golf pro. Sometimes for amusement I look at some individual stocks, but I don’t buy them because I can’t compete with investing pros. Stock picking isn’t the only activity where the option of just taking the average result is available. Consider poker. In a friendly game where there are no pot rakes or seat fees, the average player makes nothing at all. The money shifts around, but the total amount held by all players stays the same. If you want to get the average result of all players, just don’t play. In fact, you’ll beat the average of the other players this way after we consider costs like pot rakes and seat fees. A similar thing happens with indexing. Index investors actually get better results than investing pros after we consider the lower fees that indexers pay. The number of active stock pickers who beat indexing over the long run is very small, but the number of active stocks pickers who say they beat indexing is very high. Dan Hallett reports that many financial advisors are churning their clients’ assets into Deferred Sales Charge (DSC) funds ahead of the new CRM2 regulations that force disclosure of costs. DSCs are a way for advisors to get paid up front whether clients stay invested for the long term (at high yearly fees) or pull their money out early and pay a penalty. Patrick at A Loonie Saved makes a good point about how someone wanting to mislead with statistics can shop for time periods that support a particular conclusion. The Blunt Bean Counter reminds us that with low oil prices, now may be the time to look into tax planning with flow-through limited partnerships. Canadian Couch Potato looks at the merits of preferred shares. My Own Advisor takes a run at a list of questions most investors don’t ask themselves. His answers are fairly short because he’s a buy-and-hold investor. My answers were even shorter because I’m a buy-and-hold indexer. Big Cajun Man is celebrating his 10th year blogging. It doesn’t seem so long ago that he got started. If you buy an annuity for $100,000, and it pays $6000 per year, that seems like a 6% return. But that’s not actually the interest being paid. Most of each payment is just your own money returned to you. Here I try to work out what interest rate an annuity actually pays. To do this, I worked out what interest rate the insurance company would have to make to exactly cover all the payments to a large group of people who buy the same annuity. For that I needed actuarial tables that predict how many people will live to each age. I used data from Statistics Canada. Note that this is not the same as just using average life expectancy; I actually assume the insurance company keeps making payments to remaining survivors each year. There are many types of annuities. Here I focus on the simple case where there is no guarantee period, which means that the payments stop when you die, even if that happens shortly after buying the annuity. I also looked only at single person annuities with level payments (no increases to account for inflation). 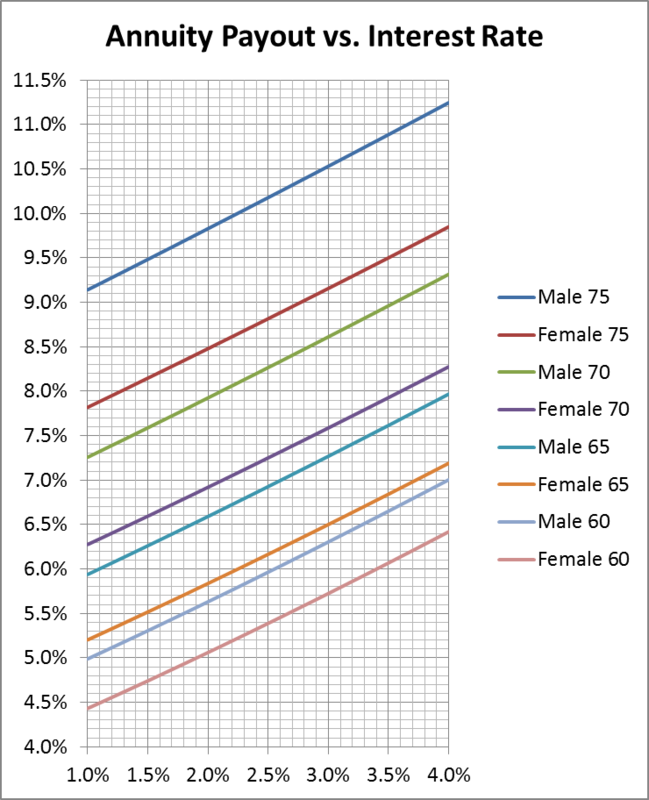 I repeated the calculations for males and females of ages 60, 65, 70, and 75. The following chart shows the results. To use this chart, take the annuity payout percentage and find it on the vertical axis. Then see where it meets the appropriate chart line to find the interest rate on the horizontal axis. For example, RBC’s Annuity Calculator tells me that a 70-year old man in Ontario would have to pay $313,820 to get $2000 per month ($24,000 per year) for the rest of his life. This is a payout of 7.65%. The chart says the insurance company needs to earn 1.6% per year on the man’s lump sum to break even. Of course, this 70-year old man is getting more than just 1.6% interest. He’s also being freed from longevity risk. Well, maybe he’s just being partially freed. After all, the real value of his payments will decline with inflation over the years. Even with the reduced longevity risk, 1.6% interest seems quite dismal. That’s unlikely to keep up with inflation. I like the idea of reducing longevity risk, but the payouts on annuities just seem way too low. You can see this more clearly if you look at annuities that increase payments every year to account for inflation. The starting payments on these annuities are much lower. This is just one more example of how you have to sacrifice returns to eliminate risk. In his upcoming book The One-Page Financial Plan, Financial Planner Carl Richards lays out his approach to helping clients with their finances. His methods are certainly far different from the mutual fund salespeople I’ve dealt with in the past. The book gives you a roadmap for figuring out what is truly important to you. The idea is this will put you more at ease with your finances and make future decisions more clear-cut. The book is very well written without much math, making it an easy read. For Canadian readers, this book contains a few references to 401(k)s (the U.S. version of a Canadian RRSP). Other than that, almost everything in the book applies well to investors in any country. Richards finds that most new clients expect to hear some sort of financial trick or a hot tip that will make them lots of money. Of course, that doesn’t exist and Richards goes through a set of steps that puts choosing investments last instead of first. Next come some financial goals that include specific timelines and costs. It’s normal for initial list of goals to be in conflict with each other because they all compete for money. This is when you go back to the values to see which goals are most important. Together, your values and goals form your one-page financial plan. “Make sure to give yourself permission to not obsess over [your goals]. Remember that they’re guesses.” Your goals and priorities may shift over time. When faced with financial decisions in the future, you can pull out your one-page plan to guide you. “Instead of getting hung up on predicting when the next downturn will occur, simply accept that it’s inevitable, and focus on sticking to your plan when it does.” I find this kind of attitude comforting. Instead of hoping that stocks keep going up, just give in to the certainty that a crash is coming at some point, followed by a recovery. Overall, I quite enjoyed this book, and I think thoughtful readers will get value form it. The book is scheduled to go on sale 2015 March 31. The best part to me was the exercise of trying to identify my financial “values.” If my wife and I can agree on these, the rest of the planning comes fairly naturally. The idea behind annuities sounds great. You get a predictable income for the rest of your life no matter how long you live. This frees you from worries about how much you can safely spend each year. Rob Carrick’s recent article covered many important details concerning annuities. However, he left out a very important part of the discussion. The elephant in the room with annuities is inflation. Canadians like to complain that their CPP (Canada Pension Plan) and OAS (Old Age Security) payments are too small, but at least they are indexed to inflation. Imagine how small these payments would look if they never changed for 25 years. An ancestor of mine held a senior position and retired decades ago with what was considered to be a very generous pension. However, the payments weren’t indexed to inflation. By the time he died 23 years later, his monthly pension payments had dropped in value by nearly a factor of 3. Take your current income, divide it by 3, and imagine trying to live on the smaller amount. When you see an annuity quote, it almost never includes any kind of indexing. This makes the payout seem quite good if you don’t think about the erosion of inflation that starts right away. If you get a quote for an annuity with a built-in 3% increase each year, the starting payout is much lower. Even rarer in Canada is an annuity that is indexed to inflation the way CPP and OAS are. Such inflation-indexed annuities have very low starting payouts. Some common advice is to wait until you’re in your 70s to buy an annuity. The reason given is usually that the starting payout will be higher when you’re older. The more important consideration is that inflation will have less time to erode your payments. However, you would still be taking on the risk that we might have another period of high inflation. If you’re considering buying an annuity, look into indexed annuities. Anyone who tells you that indexing isn’t important either hasn’t thought it through properly or is trying to deceive you. I’m a happy customer of BMO InvestorLine. Among other great features, their non-registered accounts treat the cash holdings like a regular chequing account. You can get a debit card for it and make cash withdrawals from bank machines. I’ve run my personal transactions through such an account for years. However, they only give 2 free withdrawals per month. This limitation isn’t too bad for me because I don’t make many transactions. Until a little over a year ago, I paid 60 cents per excess withdrawal. Then it went up to a dollar. While at a cash machine recently I saw an announcement that this would soon rise to $1.25 per withdrawal. This was enough to make me do the work to open a new account and get free transactions from Tangerine. Another bonus is Tangerine will pay me a tiny amount of interest on my balance. The process of opening a Tangerine chequing account is surprisingly easy. The longest part was writing a cheque to start up the account. But even then I was able to download a Tangerine application to my tablet to take pictures of cheques for deposit. So, I didn’t even have to send anything by snail mail. I did all this on a Friday afternoon and my Tangerine account was open with my money in it by the following Monday morning. Once this is fully set up, the biggest change for me will be going to Scotiabank cash machines rather than BMO cash machines, but both are convenient for me. Now we get to the self-serving part of all this. If you’re a new Tangerine customer and you open an account, you can type in an “Orange Key” code to get a small cash bonus. This code actually belongs to another Tangerine customer. My Orange Key is 43337422S1. If I understand how this all works correctly, if you use it, both you and I get small cash bonuses. But suit yourself. I didn’t open this account to go for bonus money. But I won’t turn it away either. Warren Buffett’s latest letter to Berkshire Hathaway shareholders contains a brilliant prescription for managing a personal portfolio. I was prepared to write a post quoting a few good lines from his letter, but his message on individual investing on pages 18 and 19 is so good that I will devote the rest of this article to summarizing it. The goal of investing is to increase the purchasing power of your savings. Over the past 50 years, S&P 500 stocks, with reinvested dividends, have increased in value by a factor of 113, while the U.S. dollar’s purchasing power has dropped by about a factor of 8. This is one article I may reread myself if I ever start to doubt my approach to investing.